Children of Men is a vision of the not too distant future (2027 to be precise) where the human race is no longer able to reproduce. Whilst I liked the look of the trailer, I’m usually a fan of Clive Owen who plays the leading role in this film, and so expected this to be a pretty average affair. Instead I was immediately blown away—literally. In the first scene we follow Owen’s character (Theodore Faron) leave work, walk through an almost apocalyptic London high street, go into a cafe and grab a coffee. In the background we hear about the death of the worlds youngest human, 18 year old ‘Baby Diego’. 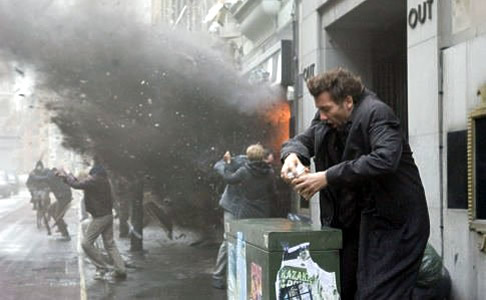 As Theodore leaves the cafe, it suddenly and shockingly gets blown up. This was one of many scenes in which the action almost leaves the boundaries of the screen, enters the cinema, before taking you along with it. I have a number of reasons why I enjoyed this film—the surprising exit mid way through the film of a character we believe is central to the plot, another excellent performance from Michael Caine, an intriguing and interesting plot and the comic moments played against the depressing image of what the world could be like in just twenty years time. What I really enjoyed however was the attention to detail, that made this vision of the future play like it had already happened. It was like watching a film set in the past, in which you recognise it’s place in time because of the clothing, the surroundings (cars, posters, logos) and cultural references. So much attention was paid in this film to such details (my favourite being Clive Owen wearing a fleece from the London 2012 Olympic Games) that it felt totally believable, and never did this vision feel like it was being over played. A true master piece, and easily my favourite film of 2006.